A cofounder of thatgamecompany makes her own journey. Usually when a videogame company creates a title that sells well for its target and enjoys a positive response from game critics, the heads of that game company cash the bonus checks and begin work on another game. Well, except for Thatgamecompany. Jenova Chen might be the creative genius behind games like Journey, Flower and FlOw, but Kellee Santiago has been the operational manager making Chen's designs come to life. In an odd bit of timing, on the same day that Chen announced Journey is now the fastest-selling game on the PlayStation Network, Santiago said she is leaving the company she founded with Chen in 2006. Santiago stays mum on what she will do next, but walking away from a hit like Journey will likely land her a position where ever she wants in the game industry. "After doing these three games, I think it was a really great opportunity for all of us to look at what we've learned and what I've taken from that experience, and go forth and take it into new arenas," Santiago said. She felt she had accomplished all she could in supporting the creativity of Chen. "Much of my work at Thatgamecompany was really supporting Jenova's visions for the types of games he wanted to make, and I felt like I have done everything I needed to do there, and that he's in a great place now to go on and continue with some of the other people at Thatgamecompany, to take that to a whole new height." Jenova Chen supports Santiago in her new endeavors. "While we want to continue the path of Thatgamecompany, Kellee has found a new direction in her career," he said. "Though our path in the future may be different, as TGC begins our next project, we wish Kellee a good journey and that our paths may cross again." Unlike other studio heads, Santiago has a perfect representation of her work at Thatgamecompany to go back to whenever she wants. "When we play through Journey now, it has a special meaning for us," Santiago said. "It makes me think about everything we've accomplished." 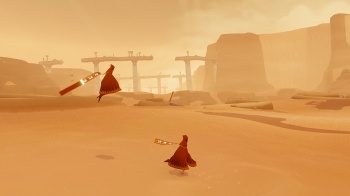 The pair attended the University of Southern California's game design program and founded thatgamecompany the next year based on the success of a student project called Cloud. Though they worked together for six years, the split between Santiago and Chen appears to be amicable. I am looking forward to what these two comparatively young voices will be able to accomplish treading their separate path through the game industry.